From the ancient monuments to the beautiful islands, this Greece tour is a once-in-a-lifetime vacation! Baggage handling not available on high-speed ferries. Motorcoach; two ferries; flight Santorini-Athens. Free Wi-Fi available on your motorcoach and in most hotel lobbies. 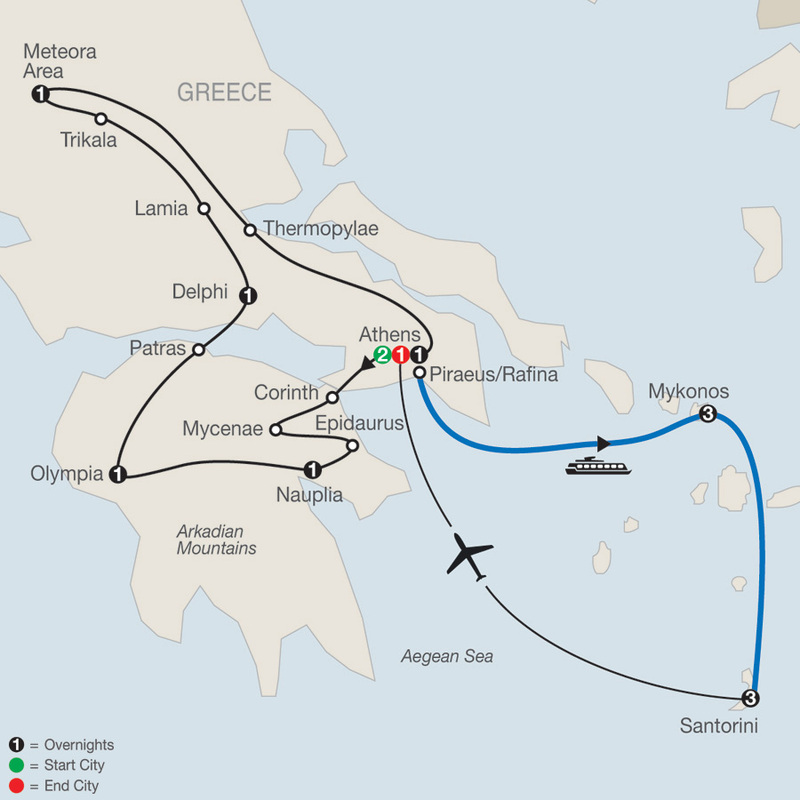 Meet your Tour Director and head for the port of Piraeus or Rafina this morning. Around 7:30 am, sail into the deep-blue waters of the Aegean Sea. Later, dock at the mountainous island of Mykonos, where mythology’s Heracles defeated and killed the giants. Here, characteristic windmills, swaying palm and eucalyptus trees, and dazzling white Cycladic architecture greet you. At a local restaurant this evening, sample local specialties, like louza loukaniko (sausage) and kopanisti (peppery goat cheese), then mingle with the locals at a quaint taverna or take a bus to the main square of Mando Mavrogenous. The granite island of Mykonos is one of the most characteristic of the Cyclades and has retained its timeless beauty. Walk through the network of narrow streets and visit the CHURCH OF AGIA KIRIAKI, renowned for its beautiful icons, and also taste a traditional Mykonian dessert, Amygdalota. Stroll around the town’s waterfront in search of Petros the Pelican, the island’s celebrated mascot. Afternoon at leisure to relax or for individual activities. A whole day to do just as you please. Relax in the sun on one of the beautiful golden sandy beaches or take a short boat ride to see the archaeological ruins on the nearby island of Delos, a UNESCO World Heritage Site. 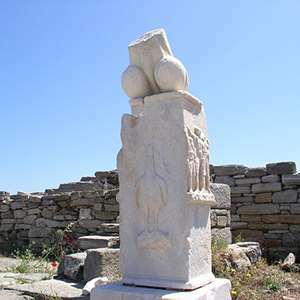 Inhabited since the 3rd millennium BC, Delos was known in ancient times as a sacred sanctuary and, later, as the birthplace of the twin gods, Apollo and Artemis. Today, board a high-speed EXPRESS FERRY and sail to Santorini (Thera), the stunning “Black Pearl of the Aegean” and, according to some, site of the legendary lost continent of Atlantis. 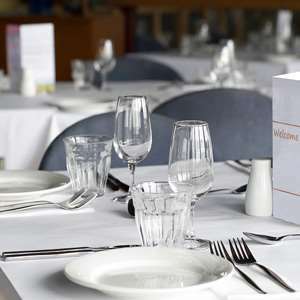 Tonight, enjoy a traditional Greek meal. Spend the morning getting acquainted with the history and creation of Santorini. Stroll along the cobblestone streets and enjoy the local atmosphere. Taste traditional Ouzo. Later, maybe relax in one of the many cafés, or why not take an optional excursion to the cliff-top village of Oia for one of the world’s most breathtaking panoramas? Colorful sun-soaked beaches, stunning views, and tastings at famous local wineries are yours for discovering in your free time today, or join an optional excursion. Enjoy time at leisure before transferring to the airport for your flight to Athens. This fantastic introduction to Mykonos shows you the Cycladic Island¿s most famous beaches, a bustling village with an important ancient monastery, and the 19th-century lighthouse with sweeping views of the crystal-clear emerald waters. Enjoy a guided visit of the island of Delos, the sacred island of the Ancient Greece. Enjoy the spectacular panorama and sunset at the unique village of Oia. 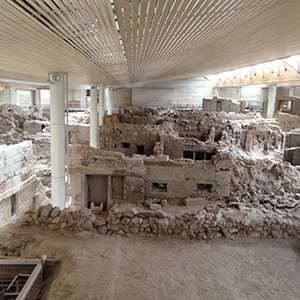 Experience a guided tour of the archaeological excavations of Akrotiri.